Hi guys! So I lost track of this series very quickly but for good reason. I've been blasting through a few series and building up a serious "to watch" list for my time in hospital next month. I'm gonna be in for at least a week so I figure I'll need some good easy to watch stuff. Send your recommendations on a self addressed envelope, please! In the UK we don't really have General TSO's Chicken, the sweet and spicy dish that is apparently ubiquitous in Chinese-American food culture. This documentary searches for the origins of the dish and why it is just so dearly loved in a country where only 1% of the population are actually Chinese. So here is a quick introduction to this new feature. For a while now I have wanted to introduce my love of film and television in to this blog. I mean, heck, I have a degree in it so I might as well put it to some good use. So I shall be sharing updates and very quick reviews of my weekly media consumption. They won't always be the most highbrow or the latest releases but they will most definitely give you a deeper insight in to my psyche. Don't forget to enter our fantastic giveaway here. I can't even describe how perfectly spot on this movie is. I usually walk out of non "Marvel Studio" Marvel movies wishing the makers would just give up and hand the rights back to Disney (*cough*spiderman*cough* and Kevin Feige. Not this one. You will never look at unicorns the same way. This week marks the 3rd anniversary of our re-launch as Faeriwood.com from our old life as Bex's Fashion Tips. It seems like an absolute lifetime since we made the switch and so much has changed since then in both Michelle and my lives. 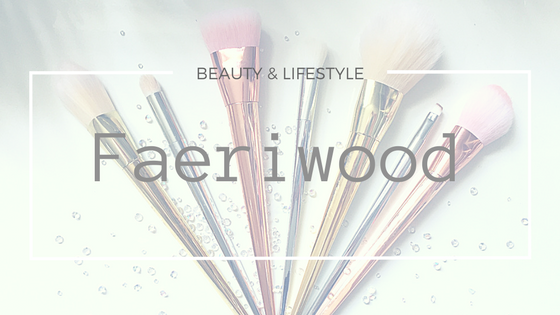 To mark the occasion I thought I'd celebrate with a little giveaway with some of my favourite brands and products I have reviewed on the blog or featured on social media. So what are the prizes?! Well I went a bit mad. A £20 Voucher kindly donated by Ground Espressoavailable to redeem in any of their stores. A gorgeous scented candle, again donated, by Filthy Velvet in the scent Hot Mama. Neary NogsArtisan Chocolate Rebel Fudgery. Your choice of the above Chai, Espresso, or Irish Cream flavours. Lemon Butter Cuticle Cream from Burts Bees. La Roche-Posay Lipikar Baume AP+. Senna CosmeticsStardust highlighting powder duo & Sparkling Lip Lacquer. It took me a long time to get in to Micellar Water. It suffered the misfortunes of my old storage system which meant it was buried in the bottom of a box somewhere and never saw daylight plus I was too wrapped up in my Laura Mercier Cleasing Oil (now discontinued) too go digging. Since reorganising and finally having it at my finger tips I am absolutely loving Micellars as either a 'No Make Up Day' cleanse or as part of a multi-step cleanse when I've got the slap on. I'd even go as far to say as it could replace traditional cream based cleansers for me, although I'll never stray too far from my La Roche PosayCleansingMilk as a make up remover. That stuff is just pure lushness on my face. Feet Feet are not something I talk about often, I don't have a phobia of them like some people but I'm still not overly keen on spending a lot of time fussing over them. For over a year now I've been using the Emjoi Micro-Pedito look after my tootsies and it's been doing a grand job. A quick buzz over with the exfoliating rollers and a slap of the foot cream once or twice a month leaves them feeling lush. That was until I handed it over to my mum in the new year. With all my various trips in and out of hospital she has been doing a f*ck-tonne (scientific term) of running about after me and I felt she needed it way more than I did. Trust me if I could send her on a weekly spa to The Merchant or Galgorm I would. I'm so grateful to have her. Alas this has left my own footsies without their monthly treat so it was time to raid the stash and kick it Old School. I knew I would be able to rustle up the perfect pedicure. The way we watch television and film at home has changed massively over the past decade and the art of Boxsetting has gone from the niche past time of die hard videophiles to a standard weekend activity often shared with family and friends and debated voraciously on social media. "Oh you watched a whole 14 hour series this weekend? Brilliant, lets analyse every detail! "The joy of having a lot of down time at the minute is the ability to unashamedly dive in to the depths of Netflix and binge to my hearts content. When I was given the opportunity to try out the Pure Luxury Collection from Eloquence Beauty I had a good long look at the ingredients before I said yes. I've become quite fussy about what I put on my skin these days and will quite happily say no to something that isn't going to be suitable. Now don't get me wrong, I'm no Caroline Hirons. I wouldn't dare to say I'm an expert in cosmetology or chemical composition of skincare products but after years of blogging and obsessing over what I'm putting on my face I know what to look out for and I know what works for my Sahara dry skin.